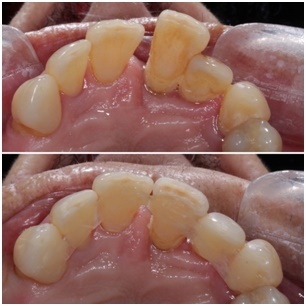 This is a form of treatment in which mobile teeth carefully splinted together therefore reducing/eliminating mobility. However, this will not treat any gum disease (which would’ve caused the teeth to become loose in the first place). Maintaining a high level of oral hygiene is advised. Treatment options for mobile/ loose teeth (or teeth becoming loose)? Do nothing – this is not recommended as the gum disease will likely progress leading to loss of teeth. As the teeth become more mobile they are likely to drift therefore resulting in the change of the bite and creating spaces between the teeth and at their necks. See a periodontist/ dentist to stabilise the gum disease, the teeth may appear firmer and then it is up to you whether you want to pro-actively have them splinted. Following stabilisation of periodontal disease to have orthodontic treatment to align the teeth. In most cases this is not possible due to the teeth being compromised. Have the teeth extracted and replaced with a bridge. This is a suitable option as long as the teeth supporting the bridge have sufficient tooth structure and adequate bone support. Have the teeth extracted and have implants placed. Prior to having implants (which involves surgery), the patient must have the periodontal condition stabilised to reduce failure. Not all patients are suitable for implants. Have the teeth extracted and have dentures placed. This is a removable appliance (advised to remove at night) replacing missing teeth and soft tissues. Have the teeth splinted. This can be carried out using various techniques (outlined below). This is least invasive, reliable form of treatment. Unfortunately, many patients are not presented with this treatment option and have teeth extracted which could’ve potentially been delayed. There are several methods when it comes to splinting teeth. However, many can lead to failure due to the intricate nature of the treatment and compromised condition of the teeth. The treatment recommended is using EverStick Perio. This is a bundle of pre-impregnated unidirectional glass fibres allowing us to reliably splint teeth using the minimally invasive dentistry concept. This offers a long lasting, minimally invasive and a comfortable solution for periodontally compromised patients. The aesthetic glass fibre is hidden behind the teeth and is bonded to teeth using aesthetic resin (after a shade match). This fibre splint is not visible therefore providing excellent aesthetics. This is a very technique sensitive procedure which can allow us to carefully reposition mobile teeth (close any spaces that may have recently opened up) and splint them together. By splinting the teeth, the adjacent teeth are used for anchorage creating one solid unit and reducing/eliminated any mobility. Furthermore, an added bonus is if the tooth does require extraction in the future, the root can be sectioned off (amputated) leaving the patients natural crown in the splint (aesthetically the most natural bridge as the patient’s own tooth is used). This can be completed in under an hour. Dr. Krishen Shah who is always looking at ways to increase patient comfort, has extensive experience splinting periodontally compromised teeth with Everstick Perio. There is a reduction in the gap between the front two teeth. 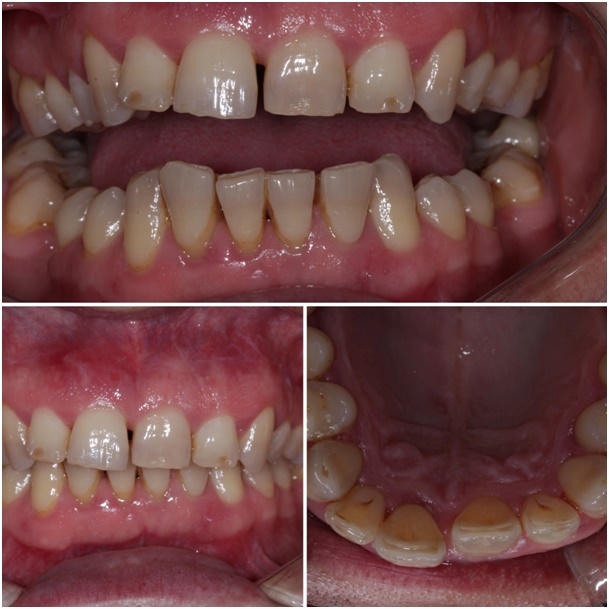 Unfortunately, due to ill health, this patient’s teeth have really suffered in the last few years. This patient had a loose front tooth which she was resigned to losing. 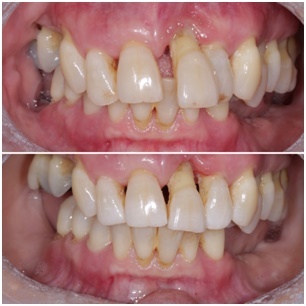 She wanted to delay having a bridge/denture and wanted to avoid invasive treatment (implants). 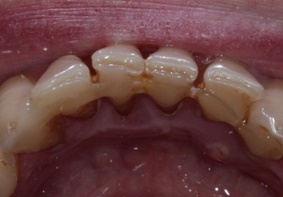 Several other front teeth were also mobile and this patient opted for a glass fibre reinforced splint (having presented all options), with the possibility of amputating the really loose tooth in the future leaving the crown of the tooth acting as a natural bridge. 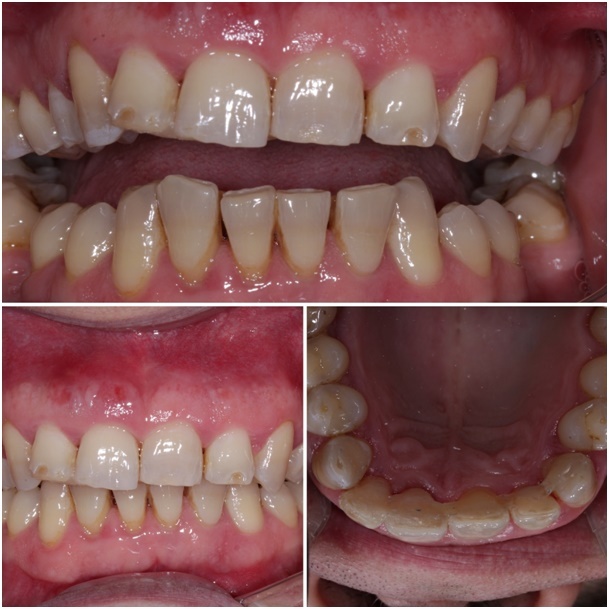 This was a difficult case to splint due the severe mobility, the teeth were also re-contoured and the patient opted not to have the black triangles concealed as she was already ecstatic with the results.